Our cells contain little pieces of RNA called microRNA. Once considered junk snippets of RNA, microRNAs turned out to be one of the major regulators of gene expression. Specified by the sequence embedded within a short 21-22 base pair, microRNA targets a complementary mRNA and lead it to degradation. As a result, the corresponding DNA message does not get translated into a protein. Thus microRNA acts as a molecular eraser that cancels a message to avoid overproduction of a particular protein, for example. The molecular details of the gene silencing machineries have not been investigated thoroughly. Researchers led by Assistant professor, Sua Myong reported in recent Proceedings of the National Academy of Sciences (Koh et al, 2013 Jan 2;110(1):151-6) that unexpectedly, the RNA binding protein, TRBP actively diffuses on RNA. 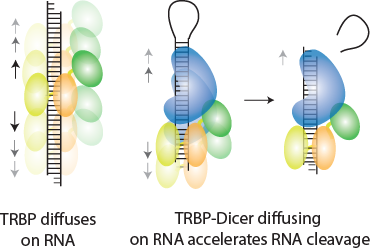 When coupled with the cleavage enzyme, Dicer, TRBP’s diffusional behavior is capitalized on achieving accelerated cutting of the RNA. Professor Myong is a recipient of the 2012 NIH New Director’s Innovator Award (http://commonfund.nih.gov/newinnovator/Recipients12.aspx) which supports this project and development of experimental platforms to quantitatively assess the gene silencing pathway.